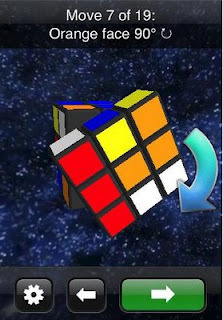 Cube Cheater iPhone App - Life-saver or fun-killer? The verdict from my better half: It's more of a fun-killer than a lifesaver. However, various general written instructions that are available - NOT customized to your particular cube state - are less fun-killing. They're more like Sudoku, where you learn a process and apply it, with some strategy, to reach a satisfying result. So to those of you with cubes: avoid the app, but seek out the guides - and have fun!